Treat yourself by enjoying the beauty part of Mentawai islands which you may missed to visit. Here we share 6 HIDDEN PLEASURES IN THE MENTAWAI ISLANDS! One of the most popular beaches in Nort Sipora, the Mentawai Islands. 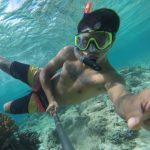 Along the clear blue water, coral park, and incredible landscape, this beach has another tourism supports such as homestay and caefs which spoil the visitor. Green hidden canyon with breath taking waterfalls named Pujujurung is located in Goiso Oinan Village on North Sipora. It takes several minutes walking from parking area to the destination through the jungle area. Not far from the waterfall, you will meet the green canyon which leads you to an amazing water hole that reflects the sunlight. Nearby the location of Pujujurung waterfalls, you ‘ll meet a secreat garden with green scenary and the fresh water around. During the dry seasion, the water is cristal clear translucent where you can see untilthe bottom side of the pool. Pasir Putih Island is a white sand dune located between Pototoga island and Silabok island. We need to use boat to reach this place from Tuapeijat Harbour. Another special destination in North Sipora is an island called Pulau Panjang. It is one of North Sipora’s best snorkeling spots. This islands is normally quite because no one live here unless for farming activity. One of the less explored beaches in North Sipora is Batu Dinding Beach. Located near the Km. 6 Tuapeijat road, but the way to reach this place is quite challenging. Started from eastern side of Sipora, the trekking takes more or less 1,6 Kms to get to this pristine location that is worth to see.